Learn how to start an IM conversation with a Skype for Business contact. The following procedure describes how to perform tasks on a computer running Windows. To see instructions for other devices, see Specific "how to" instructions for your device. From Outlook, hover over the contact's picture and click the Quick IM icon. .
Click Send to send your message to the other person. They'll receive it on their computer or other device on which they have Skype for Business installed. In Outlook 2016, hover over a contact's picture to reveal the Skype for Business quick menu. Type your message and click Enter or the Send button (which looks like a paper airplane). The Skype for Business presence indicators and quick menu are not available with Outlook for Android. In Skype for Business for Android, type the person's name in the Search box, click the person's name in the recent list, or tap the Contacts icon and then tap their name in the Contacts list. Tap the IM icon. It looks like a speech bubble. Tap the Send button (which looks like a paper airplane). The Skype for Business presence indicators and quick menu are not available with Outlook for iOS devices. Enter your message at the bottom of screen where it says Type a message here. The Skype for Business presence indicators and quick menu are not available with Outlook on the Windows Phone. In Skype for Business for Windows Phone, tap the Search icon, then type the person's name in the Search box, and tap them in the results. Or tap the person's name in the Skype for Business Contacts or Recent list. Tap Tap to type, and enter your message. Skype for Business is not currently available for Mac OS X. In Outlook on the web, click on a contact to show their Skype for Business quick menu. 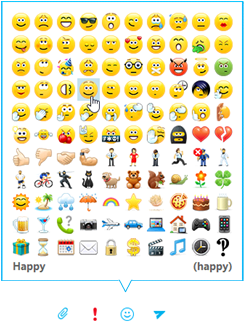 Click the IM icon to open the Skype for Business IM window. Type your message and press Enter. With Skype for Business, I can connect instantly with my team from Outlook, even when we’re in different locations. If I wanted to chat with the whole team, I could click the IM button in the ribbon and select Reply All with IM. In this case, I only need to talk to Molly, so I’ll click on her picture to start a conversation. Molly is on her way to a meeting, but she’ll get the instant message invitation on her iPad. She replies… Looks like it’s time to pull Tony into the conversation. With Skype for Business, I can connect to my team members from anywhere – across a variety of devices.